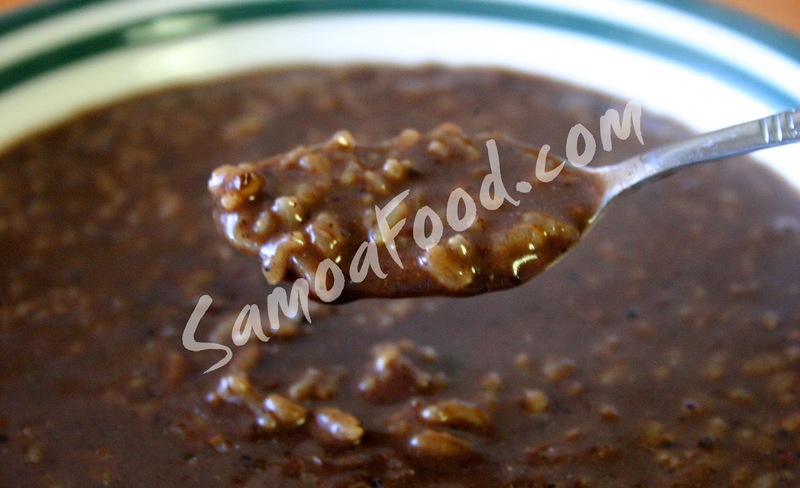 If you've ever emailed me or commented asking "Where can I buy koko Samoa? ", well today, dear readers, I have the answer - King Koko Samoa! Now doesn't that name bring to mind a good, strong drink? I'm so happy to welcome to the blog Michael King who is the production specialist at King Koko Samoa. He'll share with us the story of his long association with Samoa's beloved drink, the secret to making quality koko and a promotion that could see you win 10 blocks of King Koko Samoa. 1. Please give us a brief background to your company. Hawaii with a desire to bring the Koko to the Samoan community living there. Samoans loved our Koko. It has been 30 years since I did that. found that I still remembered some of the secrets that my Samoan mother taught me. started making Koko again and things have progressed pretty quickly. 3. What makes your koko stand out from the rest? and keep coming back to the stores for more. Yes, I remember ordering some koko straight from Samoa once and there were burnt nibs in my drink, which annoyed the heck out of me. Glad that your company thinks quality control is important. 4. In your opinion, what's the ideal food to serve with koko? 5. Is there anything else you'd like to share with my readers? 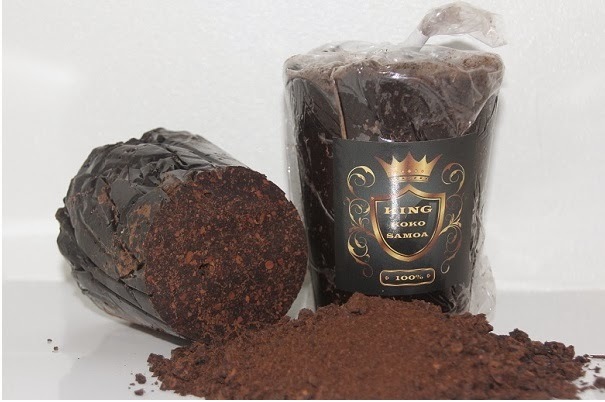 Anyone can purchase blocks of King Koko Samoa on our website: kingkoko.com. King Koko Samoa is on Facebook so head over there and like their page so the promotion can get underway. They also have their own dedicated website where you can order online. Also, if I were in the United States, and I lived in a community where more people were looking for koko, I would be heading to the nearest Asian or Polynesian market and asking them to stock this. Hopefully in the near future, we'll see King Koko Samoa at food festivals, farmer's markets and, dare I say it, supermarkets. Many thanks to Michael for visiting us. His company is taking us one step closer to having this wonderfully unique Samoan product available to the masses. You see, I believe that Koko Samoa deserves a higher profile in the cooking world - it needs recognition not just as a drink, but as an ingredient. So, *stepping down from my soapbox*, with my fingers crossed (toes and eyes as well), I hope King Koko Samoa is the company that can do this. I make this a couple of times a month because it's quick, easy and tasty. Excellent served over white rice. Place the fish in a frypan in one layer. Mix the rest of the ingredients. Add as much water as needed for desired saltiness. Sprinkle with sliced spring onions. Just before Christmas a new Samoan takeaway called Tausala Kitchen opened in Brisbane, Queensland. They sell the most delicious food and all of it freshly made on the day it's sold - no masi samoa or paifala sitting around for who-knows-how-long. The cooks wake up at 4:00 AM every morning to churn out the fresh, flavorful and authentic Samoan food. I ordered a mixed plate of food, some German Buns, and some oka, and every dish exceeded my expectations. The mixed plate was a classic combination of curry, chop suey, taro, chicken and lamb. I was especially blown away by the chop suey, because the vermicelli was perfectly cooked (I am notorious for overcooking this). The lamb cuts were cooked to perfection and I couldn't complain about the portion size of the meal. In fact, the portion was so generous that I couldn't even finish it. It's enough to feed two (or me two times...hehe). There are some people that believe that lemon and lime have no place in oka and Tausala Kitchen proves why. They use the freshest fish and a tantalizing selection of crisp, firm vegetables and the result is a pure white salad where the fish is the star. Mmm, so good. Now, I don't claim to be a German bun expert, but I have eaten my fair share and I have an opinion on the thing. A particular shop which has built its reputation on its mother shop in Samoa is widely known for this product. However, I think that Tausala's Kitchen does it better. Their German bun is admittedly smaller than most, but what it lacks in size, it makes up for in flavor. The doughnut pastry is soft and fluffy and fried to perfection. The filling is made from freshly grated coconut and just enough coconut caramel to bind it together. I probably ate five of these in one sitting, they were so irresistible. If you live in Queensland, I think it is worth making the trip to check out this newest addition to the Samoan cooking scene. The cooks and serving staff are friendly and welcoming, and the shop is clean and inviting. Just so you know, I am in no way affiliated with this shop. I'm just a lover of good Samoan food and this shop ticks all the boxes. Check it out! Tausala Kitchen, Keidges Road, Bellbird Park, Queensland, Australia. I've been blogging for a couple of years now and every year around Christmas I've had this urge to have a giveaway of some sort, but I could never figure out what to give away. Koko Samoa? Might get turned away at customs. Taro chips? Would go off before they reached their destination. Coconut cream? Um, you can buy that anywhere in the world. Plus the price of postage would be more than the value of the can. So this year, I came to the realisation that I didn't have to give away food - I could give away something food-related. So here it is folks: SamoaFood.com's first ever giveaway in the form of a photo contest. 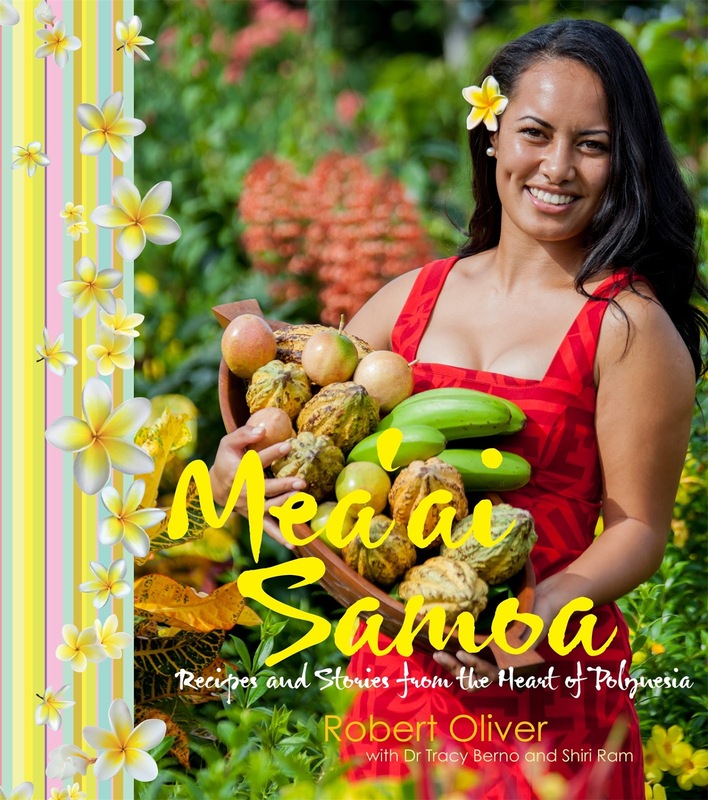 First prize is a copy of Mea'ai Samoa by Robert Oliver, Tracy Berno and Shiri Ram. Second prize is The Bone Bearer by Lani Wendt Young. Third prize is an Amazon gift voucher worth a whopping five hundred cents. Visit SamoaFood.com's facebook page for more details and if you enter, good luck! Okay, I know this page is starting to read like a book club and not like a food blog, but tough, it's my page and I'll do what I want. On that surprisingly belligerent note, I have EXCITING news. Like very VERY exciting news. Exciting FOOD-RELATED news. It's so exciting that my caps lock is getting bit of a workout today. Finally, finally, FINALLY, Samoa has its very own cookbook. Choohoohooooooo! (if you don't know what that last one is, you need to visit Samoa). Penned by the the award-winning team that put Pacific Island food on the map with their book Me'a Kai, their latest work is completely and totally dedicated to Samoan food. Check out the stunning cover. This gorgeous 288 page hardcover book is available for pre-order here or from the publisher, Random House. Mea'ai Samoa showcases Samoan cuisine like no other publication before it, and it focuses on the traditional food of Samoa, the stories of the organic farmers and their land, and on the amazing natural paradise that is SAMOA. Knowing the fantastic job that was done with Me'a Kai, I have no trouble wholeheartedly recommending this current book to all you Samoan food fans. 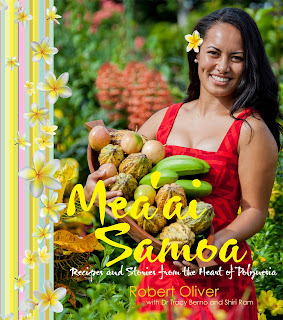 If any of you have been searching for the definitive Samoan cookbook, this is probably it, so make sure you pre-order your copy so you don't miss out. I know you all must be as excited about this new publication as I am, but (yes...there's a 'but') it won't be out for a few more months, some time mid-October. 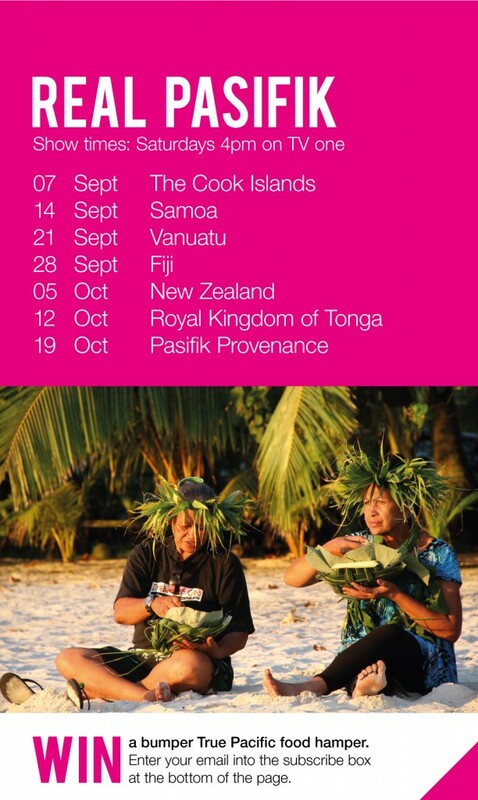 However, to bridge the wait, Chef Robert Oliver is hosting Real Pasifik, a new television series dedicated to Pacific Island food which premieres next week. So if you're in New Zealand, you lucky bugger you, then tune into TV 1 on Saturday 7th September (See schedule on the right). Also, Chef Oliver has done a TEDtalk which you can watch below. Let's support this amazing man and his team who are taking Pacific food to the world and to a whole new level. Okay, so I haven't dropped off the face of the earth, although I can understand how you might think that given my absence on the blog. What's happened is that I've landed in this hotbed of Samoan food. It's everywhere! In my relative's houses (down the road), in the shops (again, down the road). I don't ever have to make Samoan food again for myself because it's all around me, puligi, german buns, sapasui, taro...They sell coconuts, like honest-to-goodness hairy brown coconuts in the supermarket! And there's like, seven different kinds of coconut milk. They even sell barrels of povi masima in the butcher shops. I can get pisupo, elegi, koko samoa. Even size 2 pigs! Print book will be available in August. Every once in a while I get an email that moves me. For some people, my blog means the chance to remember their grandmother who made the best kopai ever, or their long-departed brother who could make oka like nobody's business. For some people, it's a chance to relive their childhood. Read on to see what this site meant for Emma and her kids. You have helped me to connect to my heritage! For that I am so so grateful. I am part Samoan, but for a long time estranged through family ignorance and situation from my Samoan relatives and culture. To look at me, other Samoans know I am Samoan - but my children are very fair and you wouldn't know they are Samoan too. Recently my daughter completed a group social studies project at school on Samoa, and seeing the lack of knowledge and support from the teacher and school really gave me a kick in the pants! My children live here in Auckland - this multicultural city, yet they exist in a mostly white bubble. None of the teaching staff are Pacific Islanders...and I realised that I am failing my kids by not bringing their heritage into their consciousness, and making it a part of their everyday life. So together we have been reading, watching, talking about all things Samoan. And to complete the project, I used recipes from your wonderful blog to cook a feast for kids in the project, and we invited our neighbourhood kids along too. We made Supasui, Keke pua'a, and the Poi banana pudding. It was a big hit! (Maybe even life-changing). Thank you Emma for sharing our culture with your children and your whole neighborhood. You really made my day with your email. And these photos were sent in by Helen and Tina from Queensland. Check out their scrumptious panipopo. Helen also has a handy tip. If you like shiny buns, then just reserve some of the sauce and when the buns come out of the oven, brush the sauce over them while they are still hot. The glaze will give them that 'freshly baked' look. Thank you Helen and Tina for sending in your photos. Thank you, Kristina, for making Samoan food all the way over there in Lithuania. I'm inspired now to try out some Lithuanian food. Spurgos looks like a nice dish to start off with. It's amazing to me how far the internet reaches - readers of our blog are making Samoan food in Dubai, Saint Lucia, Germany and even in Chile! - so I have never regretted doing what I do for this blog. I'm settling in nicely in this new location and very soon I will post up some new recipes for you all. Thanks for your continued support and for all the feedback and emails. Your success in the kitchen is also mine.